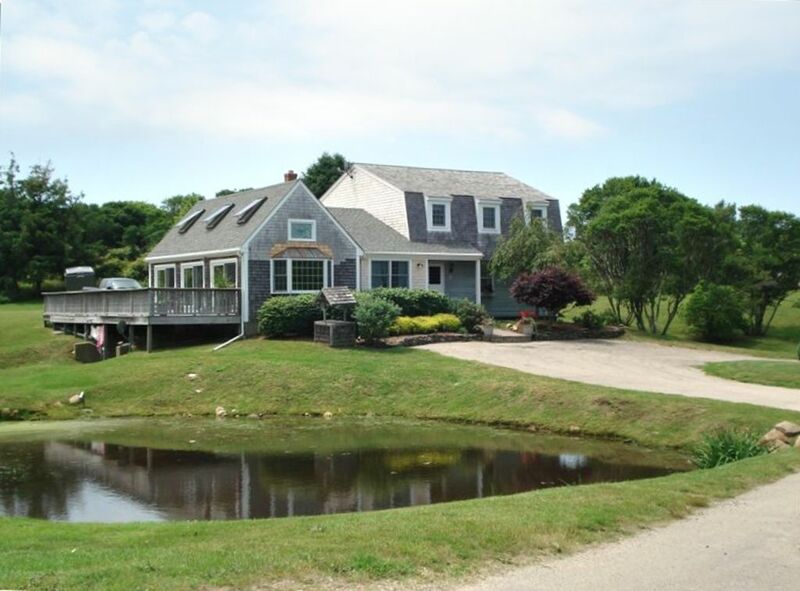 Great house available on lovely Block Island, Rhode Island, often referred to as 'The Bermuda of the North'. Home offers 3 bedrooms (1 King, 1 queen and children's room with 2 twins and 2 twin trundles), loft over family room has additional queen bed. This house has it all, fully equipped kitchen (well stocked, lots of counter space, EIK, and TV), mudroom (additional entrance with washer/dryer, extra sink, and plenty of storage for supplies and beach gear), LOTS of living space with a living room, family room and great room adjoining deck overlooking mature yard (perfect for family gatherings, outdoor dining and yard games). Home backs to nature trails and green acres. Quite pond in front of the house. House is in a private location but only a 10 min walk into town. Enjoy a great family get-away this summer! Reduced May/June/Sept/Oct rates are available. Updated kitchen. Main sink has 2 basins with an additional prep sink. Plenty of counter space and storage space. Kitchen fully equipped. In the kitchen, seats 8, additional dining table in the great room as well as deck furniture table and seating. Great spot, house large, clean, well stocked with cooking and serving dinnerware, stemware, appliances, towels, linens. Beds are all very comfortable, outdoor shower is so convenient, large family room space is a welcome addition, the outside deck is huge. My family loved it as we stayed for a week before my son’s wedding. Great vacation. This place is amazing. More than enough room inside and out for our family with every convenience and amenity; comfortable and tastefully decorated.The location is great too - close enough to town for walking, yet far enough away to be quiet. A Block Island gem! Great home with lots of space for families with kids. It allowed us plenty of room to hang out together, eat and socialize but also to spread out and have some quiet time for those who needed it! gorgeous kitchen, really nice place to stay! Great comfortable house. Super well equipped for cooking, beaching, etc. Management nice and accommodating. Reasonable walking distance to most everything but car makes things easier. A group of us rented this home for a wedding. It was a 10-15 minute walk to Old Town and had ample space for our group. There is a really nice outdoor space with the patio and the yard. We do not book through VRBO "Book Now" feature. The general process is a phone conversation to go over the house layout, what is included and answer any questions. I contract will be sent out to be signed and returned with deposit to hold dates.